Mixed in with excitement for the 2020 Summer Olympics is some heated controversy over the design of the new national stadium. 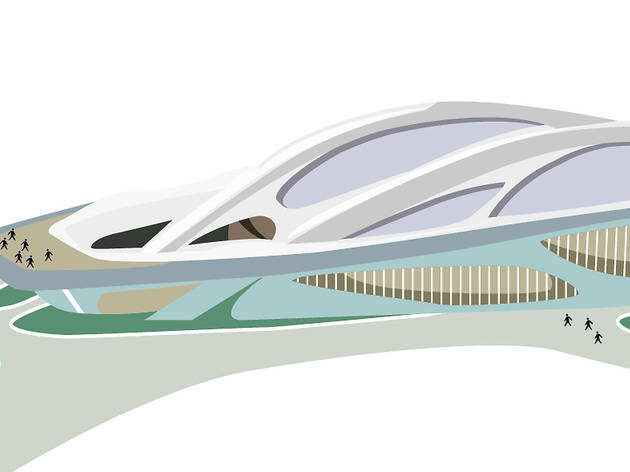 It’s been going on since London-based architect Zaha Hadid had her proposal selected in 2012. Pritzker Prize winners Fumihiko Maki and Toyo Ito ran a petition with fellow architects to protest against Hadid’s 70m-high structure. Although she downsized, the new design has still attracted criticism, including architect Arata Isozaki’s comment that it looks like a ‘turtle waiting for Japan to sink so that it can swim away’. With construction of the new stadium set to begin in October, we asked Hadid for a comment on her design, which will seat 80,000 people and boast a retractable roof. ‘Fans will demand and receive a spectator experience of the highest quality,’ she asserts. But what happens beyond 2020? Hadid assures us: ‘The Japanese Sports Council have ensured the New National Stadium will serve Japan’s many sporting communities for generations to come, with no construction works or redevelopment required for the stadium’s use after 2020.’ Onwards and upwards, then. Read more and view the new stadium design on our blog. 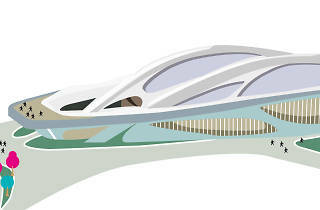 Japan New National Stadium from Zaha Hadid Architects on Vimeo. Tokyobybike.com founder Byron Kidd is quick to point out that we won’t necessarily get better cycling infrastructure just ‘because of the Olympics’, but he believes the games can be used to demonstrate the positive effect such infrastructure can have on the city. ‘With Tokyo’s promise of a compact Olympics, one in which all Olympic venues are a mere eight kilometres from the athletes’ village, the inclusion of cycling at the core of Olympic transport policy is essential,’ he says. Last year, Tokyo Governor Yoichi Masuzoe cited the possibility of a disaster as his highest priority for the games, and we assume he didn’t mean another Olympics without a gold medal in men’s judo. The Disaster Prevention Division of the Bureau of General Affairs has released an overview of its plans for the 2020 games: it aims to increase the city’s resilience through the regeneration of dense neighbourhoods of wooden houses, making structures earthquake resistant, building tsunami and rain countermeasures and securing road networks. This is one issue we expect to be handled with aplomb – if there were an Olympic event for producing mascots, the rest of the world would simply be scrambling for silver. Details of the selection process and timeline for a new mascot have not yet been decided, but after inviting leading agencies to enter a design competition last year, a winning emblem for Tokyo 2020 has now been selected. Before being publicly unveiled, the trademark registration needs to be finalised, as well as making a few tweaks to maximize its ‘kawaii’-ness. Shuichi Kameyama, Executive Director of Marketing and Promotion at the Japan National Tourism Organization (JNTO), says one of the most common complaints he hears from foreign visitors is a lack of English signage and the confusing address system. Digital signboards and a multilingual call centre will be set up in the city’s most popular areas, and all buses will have multilingual displays installed – though Kameyama believes a more effective solution lies in technology and, more specifically, free wi-fi. The address system, meanwhile, will continue to confound Japanese and non-Japanese alike. Japan received over 13 million foreign visitors in 2014 and the JNTO aims to increase this number to 20 million by 2020. But how to prevent this from hindering day-to-day life for the locals? The JNTO’s Shuichi Kameyama has the answer: by shifting the focus to Japan’s lesser-known areas. Over the next six years, a large part of his job will be convincing people to swap the temples of religion and commerce in Kyoto and Tokyo for the natural scenery of places like Hokkaido and Tohoku. Discussions on the 2020 torch relay will begin next year. As Tokyo 2020 executive director of communications and engagement Hidetoshi Fujisawa explains, ‘The planning will take into account Japanese culture, history and the country’s geography, and it is hoped we will pass through the disaster-affected areas in Tohoku.’ Two issues that need to be considered are symbolism and international relations – when the Olympic torch last came to Tokyo in 1964, it skipped Mainland China, Russia and the Korean peninsula. With political tensions currently high in all three, the flame could be used to rekindle ties… or spark another controversy.